CARACAS, Venezuela (AP) — Investigators hunting for assailants behind a failed attempt to assassinate President Nicolas Maduro with explosives-laden drones have raided hotels and seized vehicles while grilling six suspects for details of the plot. Venezuela's socialist government alleged Sunday that the detained suspects conspired with others in Miami and the capital of neighboring Colombia, though they offered no specific evidence. Opposition leaders criticized Maduro for broadly singling out his political opponents, and they warned that he might use the attack to further suppress his critics. The attack came as Venezuela is reeling from an economic and humanitarian crisis and Maduro has grown increasingly isolated. Foreign nations, including the United States, are slapping economic sanctions on a growing list of high-ranking Venezuelan officials and decrying his government as an autocratic regime. Maduro and his allies called the attack direct proof that an international plot to overthrow his socialist administration exists, while also saying that the military's response shows he still has the loyalty of Venezuela's soldiers. But analysts said the images broadcast live on television when the attack struck during a Maduro speech Saturday evening made him appear vulnerable. "Seeing trained soldiers fleeing in apparent panic and disarray before an explosion strongly contrasts with the idea of monolithic control and loyalty of security forces that Maduro prides himself on," the New York-based Torino Capital investment firm said. Defense Minister Vladimir Padrino Lopez, appearing on state television Sunday, said the attackers were trying to wipe out Venezuela's entire top leadership along with Maduro. Interior Minister Nestor Reverol said two drones, each packed with a kilogram (2.2 pounds) of C-4 plastic explosive, were flown toward Maduro, his wife and other top leaders as the president spoke to hundreds of troops during an event celebrating the 81st anniversary of the National Guard. One of the drones was intended to explode above Maduro and the other was to detonate directly in front of him, Reverol said. The military managed to knock one of the drones off course electronically and the other craft crashed into an apartment building two blocks away, Reverol said. "We have six terrorists and assassins detained," he said. "In the next hours there could be more arrests." Reverol said two of those arrested had previous run-ins with the government, although he did not give their names. He said one took part in 2014 anti-governments protests that rocked Venezuela's as it descended deeper into an economic crisis that is now worse than the Great Depression. The other had a warrant out for his arrest for participating in an attack on a military barracks, the interior minister said. Investigators continued searching the blackened apartment building near the speech site, and authorities said officers also raided six hotels, where some of the suspects were arrested and "film" evidence was collected. Officials gave no details. Two witnesses who live in nearby apartment buildings said they saw a drone hovering over a residential street Saturday evening and then heard an explosion. One witness showed The Associated Press cellphone video of a drone crashing into a building. He said the drone fell to the ground and exploded, igniting a fire in an apartment. Another witness, Mairum Gonzalez, described running in panic to her fifth-floor balcony, where she heard the second explosion and saw smoke rising. "It was so strong the building shook," she said. "It terrified me." In an address to the nation later Saturday night, a visibly shaken Maduro blamed the attack on the "far right," and he called on U.S. President Donald Trump to hold the "terrorist group" accountable. Appearing on "Fox News Sunday," Trump's national security adviser, John Bolton, said: "If the government of Venezuela has hard information that they want to present to us that would show a potential violation of U.S. criminal law, we'll take a serious look at it." The Broad Front, a coalition of opposition groups in Venezuela, accused the government of making an allegation without proof. "It's evident that the initial reaction of the government isn't aimed at attempting to clarify what happened but rather to take advantage of the situation and irresponsibly and sweepingly attack the 'opposition,'" the group said in a statement. A little-known group calling itself Soldiers in T-shirts claimed responsibility for the attack, saying it planned to fly two drones loaded with explosives at the president but soldiers shot them down. The authenticity of the message could not be independently verified, and the organization did not respond to a message from the AP. "It was not successful today, but it is just a matter of time," the group said in a tweet. Venezuela's government routinely accuses opposition activists of plotting to attack and overthrow Maduro. The former bus driver has moved steadily to consolidate power as the nation struggles to reverse hyperinflation that the International Monetary Fund projects could top 1 million percent by year's end. Last year, amid deadly, near-daily protests, rogue police officer Oscar Perez flew a stolen helicopter over the capital and launched grenades at several government buildings. Perez and several comrades were killed in a gunbattle with police after more than six months at large. Maduro said the attack left him convinced of the military's support and undeterred in carrying forward the socialist revolution begun by the late Hugo Chavez. "Venezuela will continue on the democratic, independent and socialist path," Maduro said. 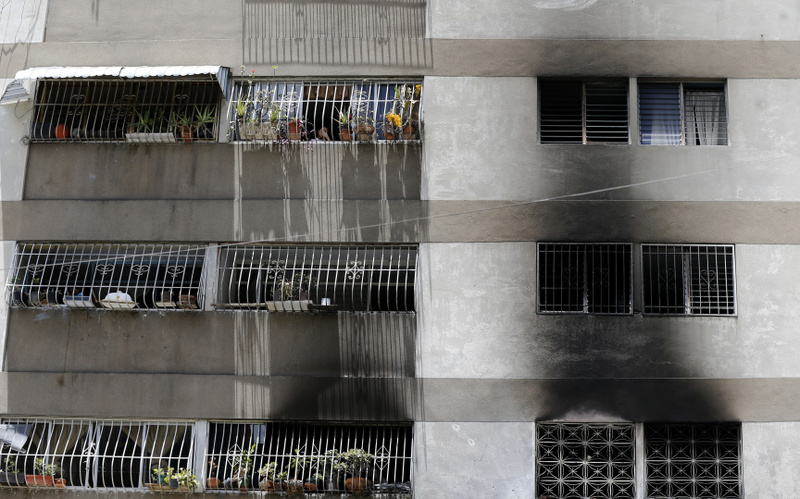 Analysts believe Maduro still holds the military's support, but also said the attack was an embarrassment for a government that prides itself on control and invincibility. "We continue to hold as our scenario one in which Maduro remains in power for coming years," Torino Capital said in its analysis. "However, given the regime's unpopularity and the depth of the country's economic crisis, we believe it is important to monitor events that can become catalysts for broader protest movements leading to regime change."